The Birmingham accent is far from its traditional image of "ugly" and "inferior" and is, in fact, regarded as "lilting and melodious" by overseas visitors, academics have discovered. Researchers at the University of Birmingham found that the second city's much-maligned accent is highly favoured by foreign visitors unaware of the negative connotations the accent holds in Britain. PhD student Steve Thorne carried out a study examining the way in which "Birmingham English" is perceived by people at home and abroad. Although the accent regularly comes out bottom in British surveys of favourite regional accents overseas visitors hold it in much higher regard. 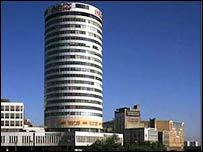 He said: "Contrary to popular belief, there is nothing wrong with Birmingham speech. "Birmingham English is not an inferior variety, nor is it inherently ugly. "Non-native English-speakers unaware of the social connotations which the accent possesses for British English speakers do not discriminate on the same grounds. "This strongly suggests that attitudes towards the Birmingham dialect are influenced by factors such as social snobbery, negative media stereotyping, the poor public image of the city of Birmingham, and the North/South geographical and linguistic divide." Mr Thorne believes Birmingham suffers because it is viewed as neither northern nor southern depriving its citizens of "any strong sense of socio-cultural or linguistic identity". The study warns that the negative attitude towards the Brummie lilt can adversely affect speakers' health, education and career prospects. Mr Thorne recommends laws should be introduced to combat "dialectism" - discrimination on the basis of language use - to give Birmingham people a fair chance. "It's very likely Shakespeare spoke with a very similar dialect"
"I would like to see a day when we outlaw linguistic prejudice"